I just bought a G17 9mm version today. 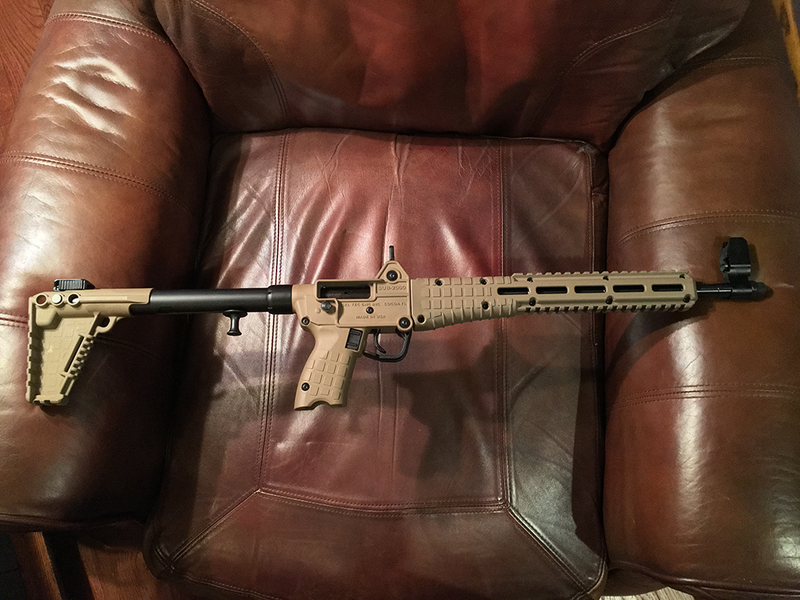 In FDE no less. It's a dandy little gun, and frankly, I'm a little surprised at the quality, which appears to be excellent. Time for a pistol caliber carbine outing!!!! Bitter Clinger wrote: Time for a pistol caliber carbine outing!!!! Unbelievable how tiny it is all folded up. It will fit in any briefcase I have without any difficulty, with room left over for my laptop and accoutrements. Interesting. 13 left and $379 from what I see. I have some Glock .40S&W magazines here; can't remember if they're 22 or 23. Which one of you did I get those from? I take back my Hogue Handall comment in the 10/22 thread. The new model has a nice screw down on the grip. And the finger relief if you need to drag a magazine out of the well. Nice! Who has the 9mm Glock version for that price? Rex B wrote: Who has the 9mm Glock version for that price? I really don't know. I paid $419.99 for the G17 version I just bought a couple of days ago. I keep hearing about better deals than that, and I've no doubt that they are out there.........I've just never seen one myself in my area (NE Tarrant County) at a cheaper price. In fact, the 9mm Glock versions are almost unobtanium in this area. So when I found one that price, I didn't argue about $20-$30......I bought the gun and went home happy, and considered myself lucky to have found it. A $20-$30 difference in price isn't going to break me. I'm seeing the 9mm versions on GunBroker.com for more than $600! 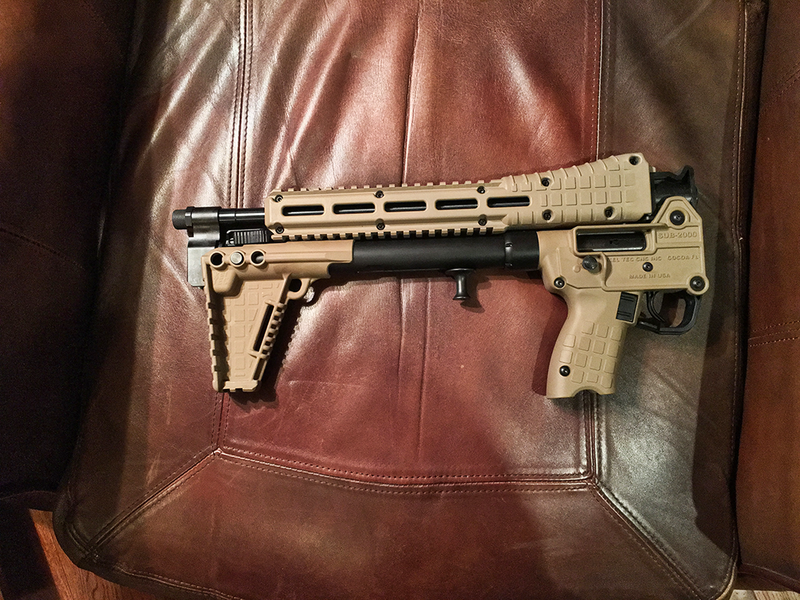 http://www.gunbroker.com/Semi-Auto-Rifl ... Keltec+9mm. The cheapest one I saw on the list has a "buy now" price of $529.99. I'm in Keller. Where did you buy yours? I think I paid aboput $550 for my Glock 19 style Gen 2 Sub2000 last year, and It's been in MANY St Davids Hospitals, Clinics, Austin area Cancer Centers and Seton Hospitals which were all posted 30.07 and 30.06 (so I left the Glock handgun in the car) this last year while I was caretaker for my uncle. Made a trip to Lubbock (For the funeral) with the sub2k, between Nov 29th and Dec 8th too, in a 16.1" laptop bag along with spare mags, 2 Laptops. 1 tablet 3 phones and chargers, two Kimber Pepper sprayers, 2 folding knives, and 3 dog pepper sprays the Post office uses.. all in the 16" laptop case. I just put the 32 round Glock mag in the Sub2000 and have a couple spare Glock 17 mags with +3 PierceGrip baseplates for extra 20 rounds each in the laptop case if that runs dry. Obviously I have to leave my Glock 26 - 10 round handgun in the car I usually carry everywhere ... because ... signs ... it's the law you know, and I obey. I carry more ammo into the OSTENSIBLY "Gun-Free" areas which post 30.07+30.06 to keep ONLY licensees handguns out because "soft target" areas attract lunatic mass shooters/robbers and other criminals, so I carry extra ammo in those locations. Last edited by NotRPB on Sat Dec 31, 2016 7:29 am, edited 1 time in total. I have one and love it too but I didn't know they have a gen 3 model.